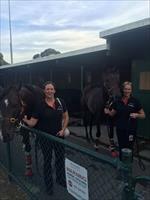 It was a good day at Sandown for the stable on Wednesday - two runners, two winners! And they are two horses who look to be just at the beginning of promising careers, Loyalty Man and Vandancer three-year-olds with bright futures. Rising in class and distance at his third run in, Loyalty Man was well supported on the back of a strong victory over 1300m at Sandown at his previous outing and over the longer trip he was all the more impressive. Always travelling well behind the leaders, Loyalty Man hit the lead at the 200m, getting clear, waiting a bit as others challenged and then kicking again to win by an impressive 1 1/4 lengths with plenty in hand. "He just wanted to pull up when he got to the front," Michael Moroney said, noting that the son of Fastnet Rock did the same thing at his previous outing. drops he is going to be a really nice horse." "He might be one of the team we take to Queensland, we will see how he goes. He is a a lovely, strong, powerful horse whose dam Imperial Beauty was a Group One sprinter but he has always wanted a bit of ground - he looks to be a mile plus type horse." "If he does go to Queensland it will be for something like the Guineas but at the moment he is a nice horse going through the classes." Jockey Jake Bayliss, who is building a good rapport with Loyalty Man was happy he was able to find so much after his lack of experience showed over the final stages. "Once he skips clear he really starts to float, he was looking at the horses coming up alongside him and he was left a bit vulnerable but when they came to him he put his ears right back and fought them off." "He is a horse with plenty of ability but he is still a big baby, I think we will see the best of him at four and whilst he was on pace after jumping so well today he will probably be better ridden a bit more quietly with something to chase." We did not have to wait long for our next winner, promising filly Vandancer proving that she is a force to be contend with in Classic races with her dominant victory in the following race, the open aged 2100m BM64 handicap. Kept on the fresh side after jarring up when third over a mile at her previous Sandown run, Vandancer was taking on the older horses but she was given a lovely ride just behind the leaders by Glen Boss. Always travelling well, the daughter of Savabeel was into the clear into the straight, hitting the lead with 150m to go, strong to the line to win by half a length. "She still learning her trade and she has a lot of improvement in her," Michael Moroney said. "She is still a little on the weak side and she is not a great eater at times which suggests that she has a bit of maturing to do." "But she is a very nice filly and they are only three once so we will have a crack at an Oaks, we just have to decide which one." "The question mark is how she comes out of it as she found the track a bit firm for her last start and that was a concern again today." "It was a good effort," he continued, "to step up to 2100m with time between runs, that is hard to do." Glen Boss was much taken with Vandancer's victory, her second from just six starts. "I quite like this filly," he said, noting that he gave her a better feel this time than last - "there was no zip there last time but she felt different today, I had a lot more energy underneath me." "No doubt about it she's got a bright future. She is lightly raced with scope for massive improvement - she is a mile of being full mature but there is a good engine there, she just needs the strength to go with it."